This entry was posted in News, panamapapers and tagged chillon consultancy, icij, Mossack Fonseca, panamapapers, tb joshua shell company. Bookmark the permalink. 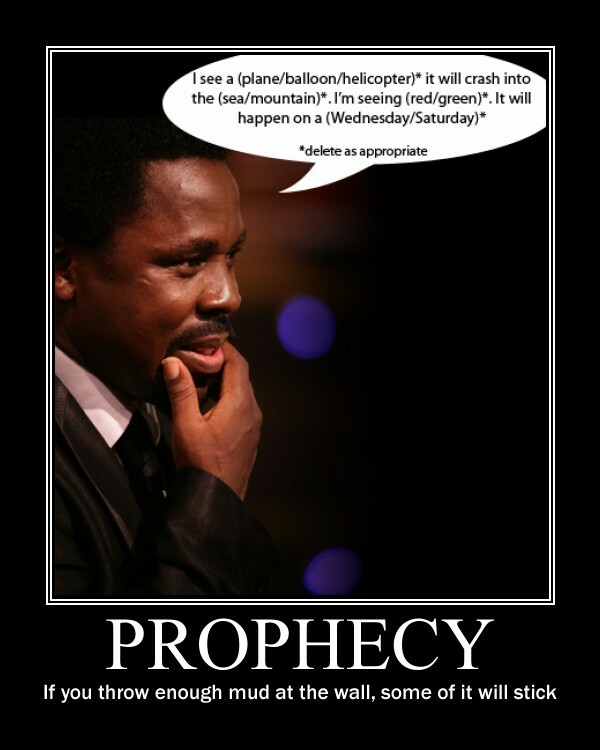 I thank God, that the truth about TB Joshua is coming out more and more. SYDNEY/PANAMA CITY – Tax authorities in Australia and New Zealand are probing local clients of a Panama-based law firm at the centre of a massive data leak for possible tax evasion. The documents are at the centre of an investigation published on Sunday by the International Consortium of Investigative Journalists, the German newspaper Süddeutsche Zeitung and more than 100 other news organizations around the globe. Süddeutsche Zeitung reported it received the huge cache of documents and then shared them with the other media outlets. The leaked ‘Panama Papers’ cover a period over almost 40 years, from 1977 until as recently as last December, and allegedly show that some companies domiciled in tax havens were being used for suspected money laundering, arms and drug deals, and tax evasion. Britain’s Guardian newspaper said the documents showed a network of secret offshore deals and loans worth $2 billion led to close friends of Russian President Vladimir Putin. Reuters couldn’t independently confirm those details. I think it is wise and fair to divulge as much as possible. What else about these shell companies can you tell us? I think there is no one in the whole world who is so hated like TB JOSHUA, why can’t haters mind their own business sometimes, every day TBJ did this, TBJ says this, you haters does it mean if he never existed you wouldn’t have anything to gossip about? @Fatima – Just show us where it was said your false prophet TBJ did this or said this and it was not true! Shez, if this is Elliot’s kind of business, it’s so cruel to all who love God. TBJ is a Man of God no matter what you say Elliot or what you are doing to his ministry. I pray for your repentance, deliverance and asking apologies from the Lord, God. Bye Idiot. Even the Prime Minister from the UK tells the Queen of UK that Nigeria and Afghanistan are two of the most corrupt countries. Not that it is anything to go by, but it goes in high circles too, so what are you saying ? That we made it all up ? On top of it you must be a serial liar yourself that’s why you keep defending your arch liar. Just as Hillary Clinton has a following who also lies by the dozen, this liar has a following because of extracting money from foolish people who go there. But slowly we see the real character shine, as in can a leopard change his spots ? But for you that does not count and what makes that you ? Brain dead and brainwashed and hypnotised by the wrong things as seen by you as right and his followers. Tell me which person likes to be lied to. You call that friendship ? You call that leading by example ? @Fatimah – the Bible says you shall know them by their fruits – the fruits you are displaying here when you resort to insults in response to my comment which doesn’t use insults is betraying you. If your prophet TBJ is teaching you the way of God you would be a disciple of Jesus Christ who is bearing fruit. If Jesus Christ dwells in you as in John 15:4 then you would be bearing fruit. You say I am an IDIOT so let us allow the word of God judge between you and me. Beloved Fatimah – Matthew 5:22 is a quote of the words spoken by the LORD Jesus Christ Himself! In your blind loyalty and commitment to defend a fraudster you are choosing to GO AGAINST JESUS CHRIST HIMSELF! Do you have another lame excuse ? Like “God will punish him” ? Adam and Eve did the first sin. So we all have to wait 8-900 years. Let’s look at a recent situation where a girl was raped and stabbed to death and it took 33 years and over to get justice, by whom ? By DNA from a next of kin. So that was God ? You piece of filth, you co conspirator of allowing disobedience to God and humanity of allowing to built an illegal hostel without building permit !!! And 116 people died and were crushed because of his actions. Do not let your path cross me anywhere !!! I will have you and your cronies arrested and sorted out of co conspiracy of manslaughter by negligence. I hope when Buhari who comes soon to the UK that they will interrogate him about TB Joshua and his actions and track his staff that goes up and down in the UK. I know my posts are monitored. Hehehehe. So u r in the Uk??? Mmmm. 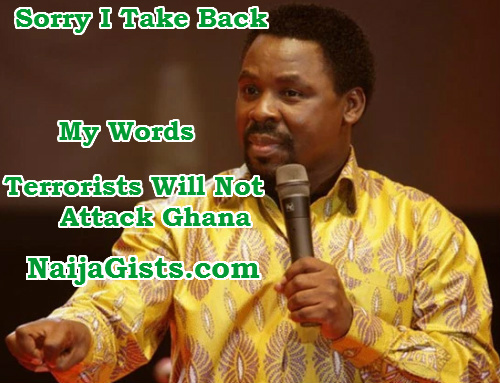 Its a matter of time you will be regreting everything you have said about Prophet TBJoshua. Its not very far. Why should anyone waste their time monitoring you. God is watching you. You can monitor all your want. I don’t have to be afraid of God that I am hiding somewhere money that I have siphoned off with a lame excuse I help poor people that is not mine. Unlike your serial liar false private prophet who has to take money from another to be a “star” and continually has to lie about so many things. That’s just disgusting. All you have on offer is your Wulu Wulu magic. God is watching us all. You think you are exempt ? Tell me which prophet in the Bible was Business man ? Did you notice Elisha? Who sent away Naaman with all his goodies ? And since you are mislead by your false private prophet and just giggle in his church about his silly jokes, you have no clue what actually is written there. However, Elisha’s servant, Gehaz such as you are, followed Naaman and deceitfully asked for a gift in Elisha’s name. Naaman gave him “two talents of silver in two bags, with two changes of clothing” (2 Kings 5:23). Gehazi hid the loot and returned home, where Elisha confronted him. Gehazi lied again to cover the matter. The Lord had given Elisha insight, and the prophet told Gehazi, “Therefore the leprosy of Naaman shall cling to you and to your descendants forever” (verse 27). Gehazi immediately contracted leprosy. Just as your false private prophet, takes all the gifts and money from others, like a false private prophet he does a great job by showing off what is not his’ but FROM GOD ! Showing off his riches to silly persons like you who blindly follow him as goats in being disobedient. And that is all you are, A GOAT morphed in a Monitor Lizard ! More please. You better go and find a business for your self. If he like,let him buy America. I don’t concern you. We all are business man period. Nonsense casanover like you. “For we are not like the many who MARKET GOD’S MESSAGE FOR PROFIT. On the contrary, we speak with sincerity in Christ, as from God and before God” – 2 Corinthians 2:17. …14In the temple courts Jesus found men selling cattle, sheep, and doves, and money changers seated at their tables. 15So He made a whip out of cords and drove all from the temple courts, both sheep and cattle. He poured out the coins of the money changers and overturned their tables. 16To those selling doves He said, “Get these out of here! HOW DARE YOU TURN MY FATHER’S HOUSE INTO A MARKETPLACE!”-Jesus said…John 2:14-16. Jesse, just wonder bisola vooke those using you to fight TB Joshua on their behalf will pay dearly as nothing us hidden in the eyes of God. As for you using fake names God is watching and surely soon and very soon you will rip the rewards of your evil doings. Please do us a favour and publish the results of your rewards when the time comes. You go on an on about that. What rewards ? Am I looking for reward like your false private prophet ? Who proclaimed this year is the year of reward ? Selfish man, that takes money from another to be a “star”. Sad piece of work. How much did he put away in foreign accounts and other countries ? Which Biblical prophet was doing this ? Show me any ? You go around to find your next victim with no regrets of what you have done. How can he belong to the Biblical prophets ? Mr Business man TBJ. Flying around in jet and can’t poo or pee in the bush because of hold up for 10 hours. Smells to arrogance and high mindedness. Sham prophet. Taking other people’s money and show off. What is that added to anything ? Seeking for medal pricked on chest ? Seeking for recognition by name ? Seeking worldly fame ? Seeking to be in limelight ? Which prophet in the Bible you see them in the limelight ? Which one ? Even Jesus was all the time in the wilderness and came out once and while. What prophet are you talking about ? The shameless with consciousness seared with hot iron TBJ that takes loot of people and show off ? You call that prophet ? We call that thief, liar, deceiver and looter and shifter of other people’s money that is not his’. 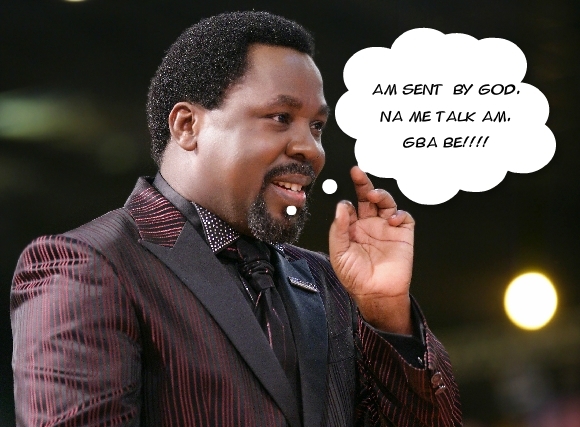 We are not fighting TB Joshua, but the clear evil he is involved with. I wonder when you will decide to stop wasting your time. Leave the man of God alone. God is the only Judge. Since God is the judge, why are you judging us yourself? Hypocrite!! Your man of Gosh is mentioned here. God already has judged him and will judge you. Whenever he is talking about this and that. He is actually talking about himself of how much he has deceived you all. When he mentions Thief, he mentions himself. When he mentions Why judge me, he is the judge himself. He should take that hand he slaps upon the camera every week while talking to himself, put his hand upon himself on his head and talk the same thing to himself. While he is actually talking to people, he is not talking to God but demanding from God to his bidding and being his errand boy. Our Father hallowed be THY NAME ! Instead of talking to God, he is talking to you of what you and him can extract from his and your god. This might help you to understand the Holy Spirit better and in whom He operates. So since you always draw attention to your idol TB Joshua and he does that to himself as well because of all the notoriety he creates on the local African media, we can safely say that these gifts are not from God but from somewhere else. Because the Holy Spirit only draws ATTENTION TO JESUS to glorify HIM and since TB Joshua is just a mere mortal man and substitute and the followers are such fanatics such as yourself, then herewith I have enough said. So by this one, hear what is been said there and you can send it also off to the attention seeker and medal on your own chest pricker of the worlds attention manipulator your idol and false private prophet TBJ. Now stop whinging and get educated for once. You can start around 18:20 minutes and then listen to it and when finished go to the beginning of the video. Mmmm . . . interesting and so true. (9) A little leaven (a slight inclination to error, or a few false teachers) leavens the whole lump [it perverts the whole conception of faith or misleads the whole church]. Looking forward to some news on this later … or has it been cancelled/postponed? We had heard 18th and 19th, not heard of anything actually taking place yet though. There is another Egyptair plane disappeared. Just wait, he had it all on paper in January, you watch. Except all the prayers did nothing. As well personal intervention. Since the latest developments he claims he has now been to Hell and back with three angels before him and one behind him. His next quest is to go to heaven. You just wait. It gets more bizarre. And why do two engineers have to sit in Kiri Kiri prison where he belongs with his disobedience to God about his illegal hostel without building permit. John 15:13 Greater love hath no man than this, that a man lay down his life for his friends. All of sudden they are not his friends. Oh wait, they are fabricating it so, that when they are released one way or another after all bribes have been sufficient to be paraded in his church as being innocent. But wait wait, money will be going to bribe them first all, you watch and see. Bribe the Judge, Bribe the Prison ward, Bribe the Journalists, Bribe the followers and Bribe the “TB Joshua is a real man of Gosh brigade. Just as he gave $ 30,000 dollars to his security in SCOAN to beef it up. You won’t see him walking on his own in Tafawa Balewa Square or Tinubu Square, doing deliverance and healing. Oh wait, wait he follows a invisible white line which we can’t see but he only can see. Always finding excuse to walk away and hide from proving himself in the wild. By their standards, it has taken too long for SCOAN to release a ‘prophecy-fulfilment’ video regarding the Egyptair crash! Hey, is it that they cannot find one which ticks most of the boxes and so it is too difficult to edit out the errors? They’ve already used too many vague plane crash predictions, surely there aren’t more left in the collection?! He must have run out of idees . . . This is not trust worthy anymore . . . What must he do now? Exactly ! His lips are constantly moving with fabricated lies. Now he has been to Hell and back and they did something to his body but he does not know what. Who wants to be done something to their body and you don’t know what ????? He is such a fantasist. Does he ever know when to stop his nonsense ? His next private elevator trip is to Heaven. No one in the Bible asks for such things, but he does. Paul was taken into the third heaven because it happened like that and he did not even wanted to talk about it. Nowhere he was praying about it. Attention seeker as per usual. It must be to sound interesting and heavy weighted. What’s next ? If he can sit between Jesus and God ? Oh wait, that was already covered a while ago. So if he has not been to Heaven, why is one of the followers claiming he was sitting in between Jesus and God ? Oh wait, it was another lie. Sigh. Now he has been to Hell and back and they did something to his body but he does not know what. Do you have a video of this? I’ve seen various news articles talking about it, but not the actual video. You see in a moment an evil demon manifesting behind those eyes. Those are not the Holy Spirit eyes that look at you there. That’s a demon. I am 100% sure about that. Replay it again and again and you well see. The man is infiltrated with demonic forces. He is an Einzelganger, someone always on his own and being separate. Not even subject to a church. This is the sole reason why he cannot be rebuked or corrected. It’s the rebellious nature of a religious/pious/charismatic witchcraft demon with Jezebel streaks. This it not slander, this is discernment in understanding and seeing through how these “rogue on their own people” work.